Refreshed and revitalised after their summer break, the Formula One teams and drivers are heading to the classic Spa-Francorchamps circuit for next weekend’s 2014 Formula One Grand Prix in Belgium. After the Hungarian Grand Prix in Budapest, where none of the highly favoured Mercedes drivers came in first or second for the first time in this season, it will be interesting to see if Hamilton and Rosberg can make a comeback in Belgium. Rosberg is the leader in the general classification with 202 points, closely followed by his team-mate Lewis Hamilton with 191 points. Third is Hungarian Grand Prix winner Daniel Ricciardo of Red Bull with 131 points, followed by Ferrari driver Fernando Alonso, who crossed the finish line in fourth place (115 points). Daniel Ricciardo of Red Bull showed a great performance and overtook Ferrari’s Fernando Alonso near the end of the race to win a thrilling Hungarian Grand Prix. Ricciardo is the fifth driver to win it having started lower than third place. This was his second Formula One victory of the season and his career and he is the only pilot to break Team Mercedes in this season. However, the bookmakers don’t expect him to spring another surprise in Belgium and will pay out odds of 19.00 in case of another victory for Ricciardo. Fernando Alonso has claimed his second podium finish of the season following a sensational display of tire management and defensive driving. According to the bookmakers, Alonso is considered to have worse chances to win than Ricciardo, odds on him up to 34.00. Lewis Hamilton finished third to celebrate on the podium after starting from the pit-lane following a fuel leak and engine fire in qualifying. In spite of his third-place finish, Hamilton is the most likely candidate to win in Belgium with odds of 1.85 because he is having a great season and managed to win five of eleven races. His team-mate Nico Rosberg came in fourth and is has also good chances to win the upcoming race in Spa (winning odds of 3.10). 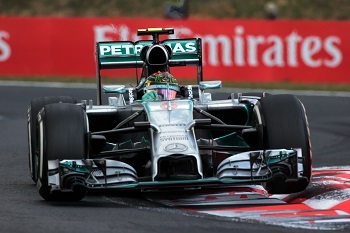 When it comes to the long-term bet, Hamilton (2.00) and Rosberg (2.10) are almost equal in chances. After a spate of podium finishes, Williams’ driver Valtteri Bottas could not meet the expectations and only finished eighth, scoring four more points to bring his tally up to 95. Nonetheless, he will be the most promising candidate after both Mercedes drivers to win in Belgium. Bottas has odds of 13.00 as well as his team-mate Felipe Massa, who finished fifth. German Red Bull driver Sebastian Vettel came in seventh, his worst finish of the season. This season seems to be particularly tough for him. While he initially had difficulty adapting to the sport’s new generation of cars, he has struggled for both speed and luck in 2014. According to the bookmakers, however, he is not without chances to win in Belgium (odds of 23.00). We have compared the odds for the Formula One Grand Prix in Belgium for you and listed them below. This entry was posted in Formula 1 betting and tagged formula 1 news, formula 1 spa, formula one belgium. Bookmark the permalink.